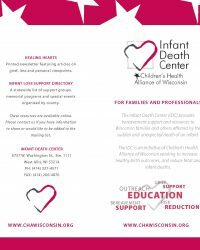 We want Wisconsin families that experience an unexpected infant death to have access to grief support and bereavement resources. In Wisconsin, more than 80 infants (on average) die unexpectedly each year. Families experiencing the death of a child enter into a lifelong process of grieving. The grief and bereavement journey is overwhelming and difficult if support is not available. Professional staff dedicated to helping families through this difficult journey is critical to the healing process. You are not alone. The Infant Death Center is here to help families struggling with the unexpected death of an infant. Whatever the circumstances surrounding your baby’s death, no parent is prepared to lose their precious child and no parent should have to feel alone on their grief journey. We are very sorry for your loss. 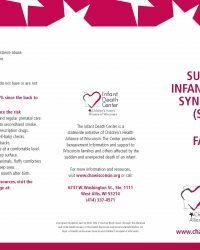 The Infant Death Center is here to provide resources and support. Please call or email Joanna if you would like to talk or learn more. Learn more about the Infant Death Center and unexpected infant loss. 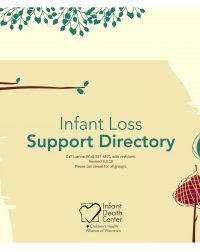 If you would like to find a support group online or in your community, please see our Infant Loss Directory. 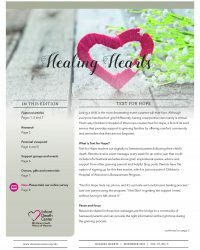 Read personal stories and articles on grief and child loss. View a statewide list of support groups, memorial programs and special events. Learn about the Infant Death Center and the services we provide for families and professionals. Learn facts and myths about Sudden Infant Death Syndrome (SIDS).